Too many people just didn't give Firefly the chance it deserved; hence it got unfairly cancelled so early. But a revival is currently underway with a film release due next year which may lead to, oddly enough, a spin off series if it becomes a success. Anyhow, This DVD box set is the mutt's nuts. Don't be put off by the idea of westerns if that's not your cup of tea, because Firefly creates it own little genre, and it rocks! At least on a par with Buffy, if not better, Firefly brought something new to our TV screens with an exciting space exploration story, not the stuff of Trek that could lull you off to sleep at times. There are many worlds the characters go to on their travels, most of the time in order to hide from their many enemies or get involved in yet another dodgy deal. Each episode is its own mini-story, and each one will grip you from the word go. The show's success is hinged on the relationships of the nine main characters on board the ship Serenity. These relationships will take you through the whole spectrum of emotions, and as you learn more about each of them, you will learn to love them all. They are just normal people trying to get by, but the paths their lives take lead to some very interesting stories! Of all the characters Adam Baldwin Jayne Cobb is the most ambiguous. Is he one of the good guys? Or will he sell his crew out if the price is right? He's already done it to one crew he was with. This character is also the most amusing and provides most of the episodes light relief. Sadly, the show ends as though there are more episodes to follow - it may have been better if the production had ended on the very moving episode The Message. This episode sees Serenity having to transport an apparent corpse back to its homeworld. But the corpse turns out to be an old army buddy of Captain Reynolds and Zoë Warren. Extras include audio commentary on selected episodes, three behind-the-scenes featurettes, four deleted scenes and outtakes. 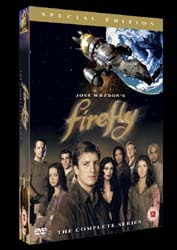 A must have for all sci-fi fans, Firefly should be your next DVD purchase. Trust us, you won't regret it. It could be the best £40 you spend all year.